With it really heating up outside, we decided it was time to take a trip to the ocean! While it would have been wonderful to actually be at the beach, we had a great time here at the school learning about it! 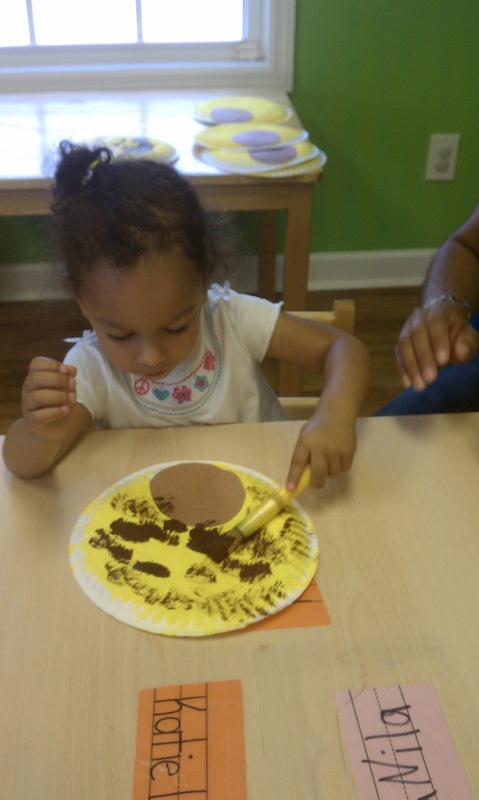 The children did so many fun activities this week- take a look! 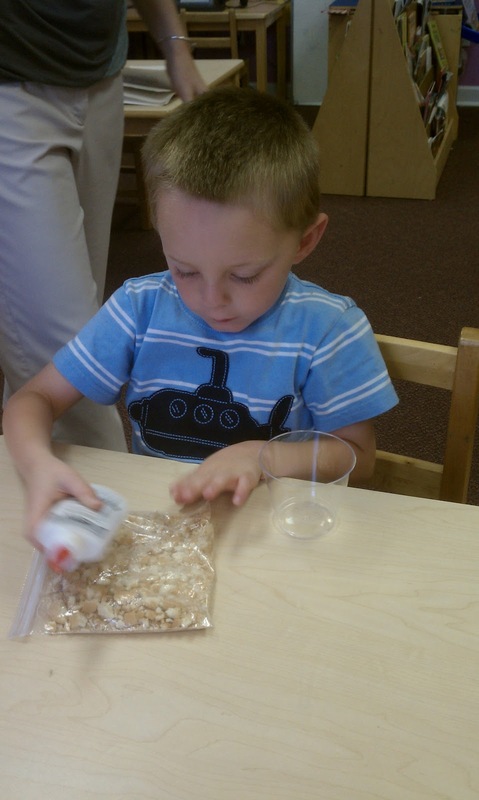 ﻿﻿The children also compared lake water (tap water) to ocean water (salt water). They discovered that they definitely taste different! 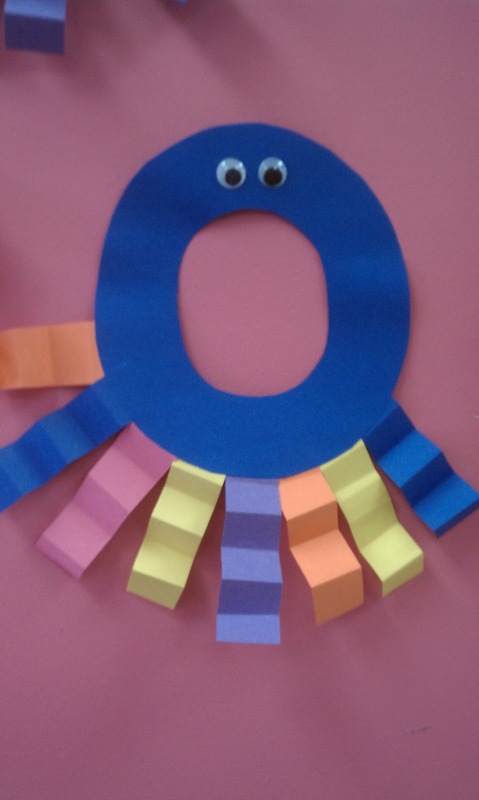 Our letter this week was "o". 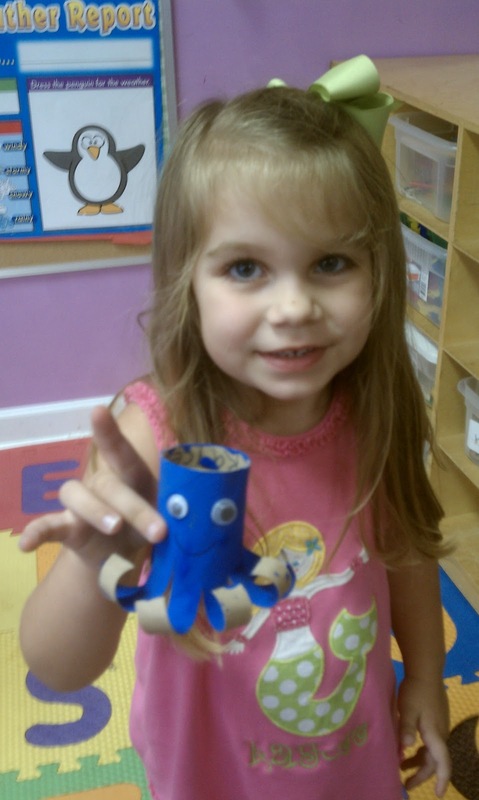 Some of the classes did "o is for owl" while others did "o is for octopus"! For our cooking project, the children made "Beach in a Cup". It's made from Nilla Waffers (sand) and Blue Jello (ocean). They crushed up the nilla waffers and mixed up the blue jello. Then they carefully layered it to make it look like the beach! 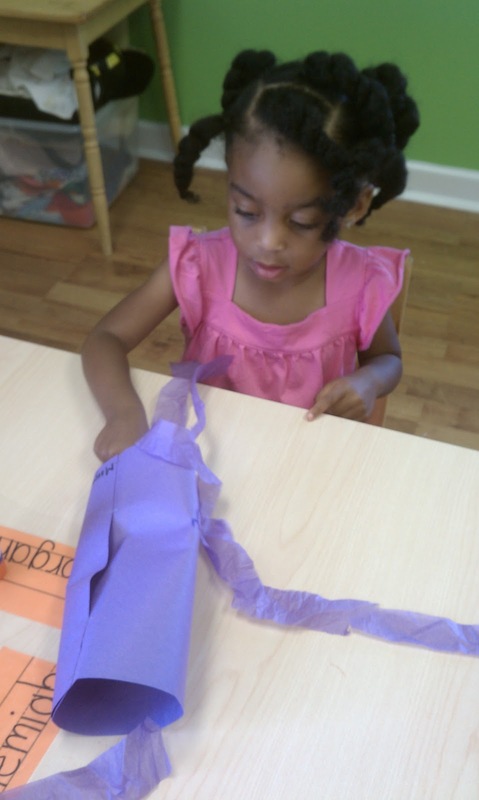 We are so happy for our Pre-K graduates but also sad at the same time! We will miss them so much and hope they come back to visit us. 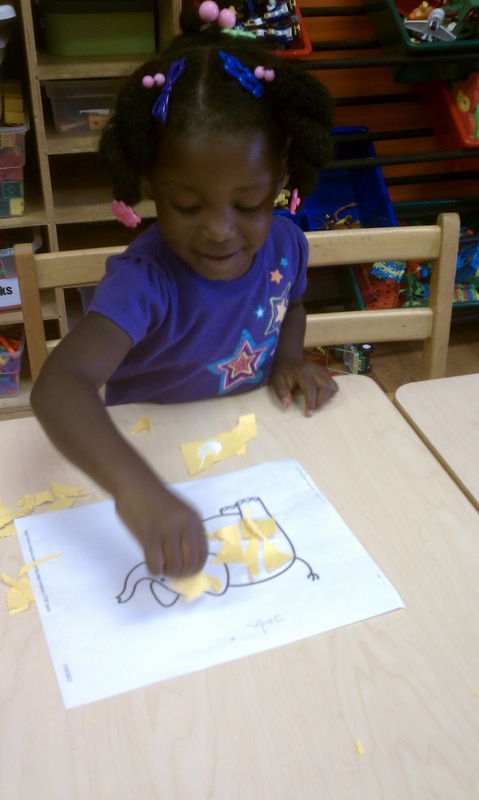 We are confident that they are ready for Kindergarten- thanks to their parents and their Pre-K teachers! We had a ceremony today to honor them. 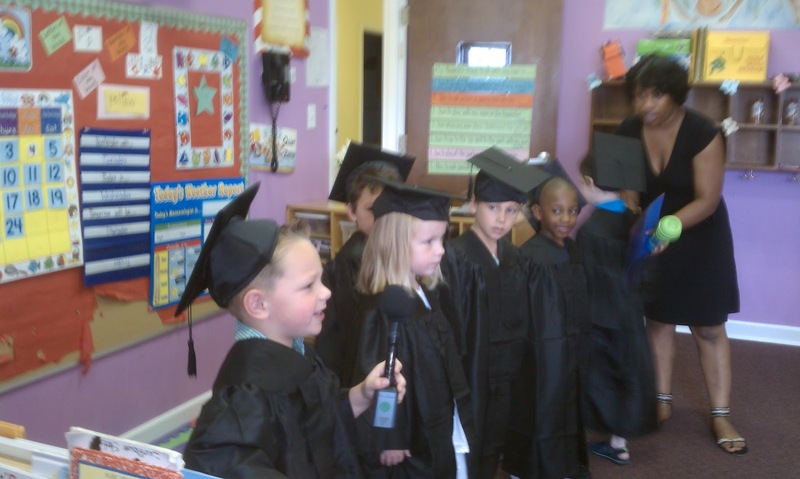 Their parents were invited to come as they dressed in graduation caps and gowns, sang a song, told their favorite thing about Pre-K, received their diploma, and enjoy some refreshments! We also enjoyed a slide show that showed some of the things that our graduates had done over the last year. There were definitely some teary eyes- including mine! Take a look! Somedays it feels like a Zoo here but this week, it really is a Zoo! The children had so much fun talking about all the different animals in a Zoo. 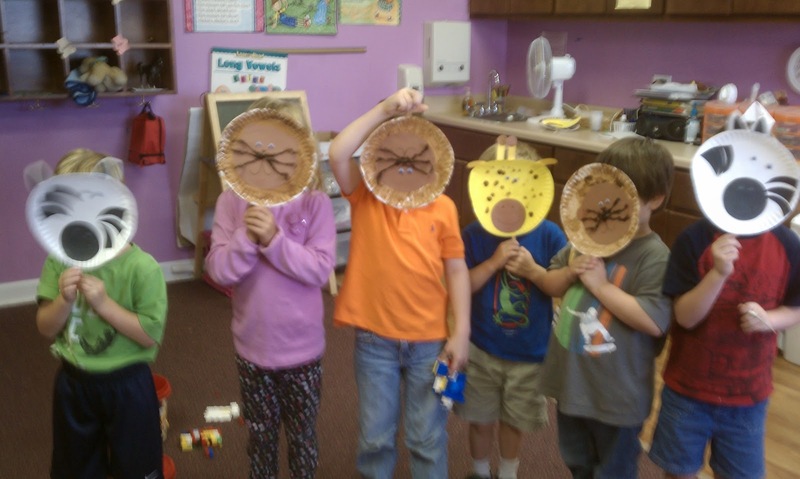 They picked their favorite zoo animal and made their very own mask so that they could pretend to be that animal. Some of the classes even played a game where they pretended to move like the different animals that you might see in a zoo. The children also compared the animals to find things that were the same and things that were different. For example, they talked about how some have spots while others have stripes. This gave a great way to practice making patterns with cards that had stripes and spots. Even during snack one morning, they sorted the animal crackers out. 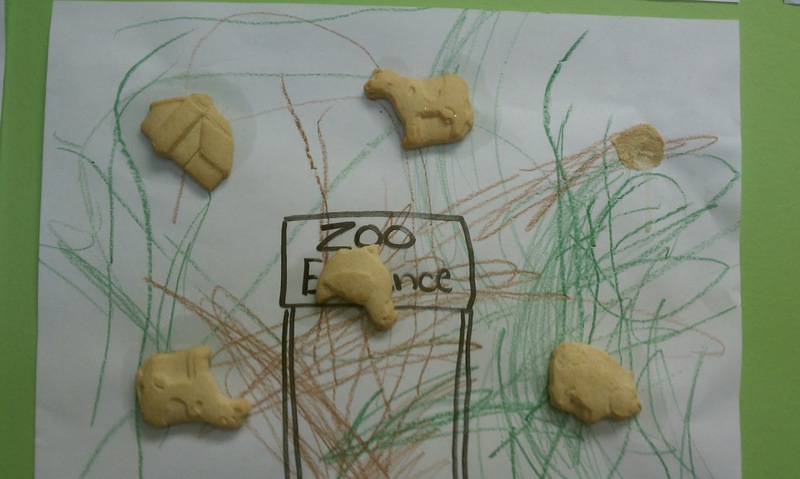 The 2's then glued them to a scenery to make it look like animals in a zoo! This was one time that it was okay to play with your food! 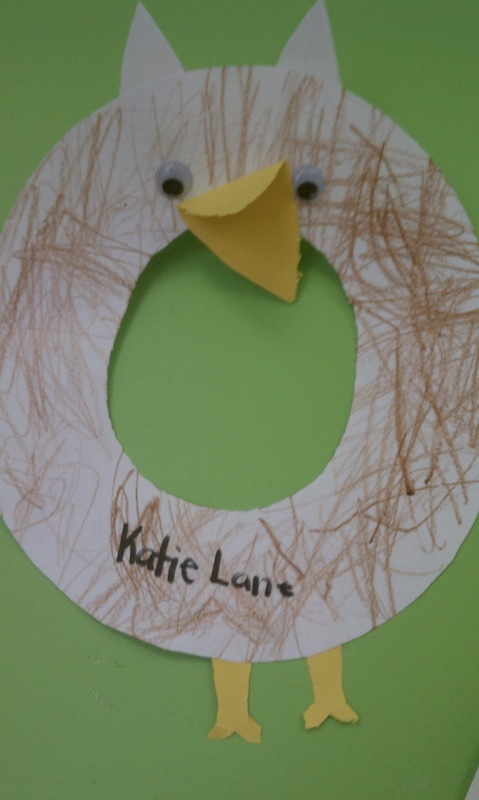 Our letter of the week was "n". 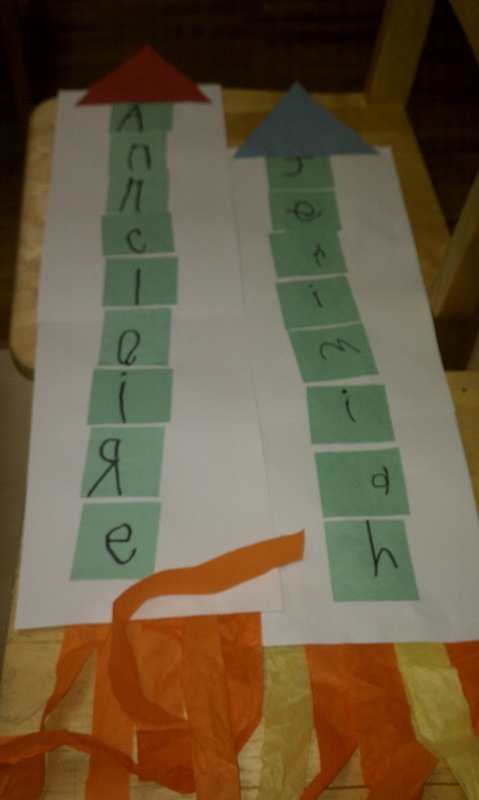 The 3 year olds glued things onto an "n" that started with the letter. 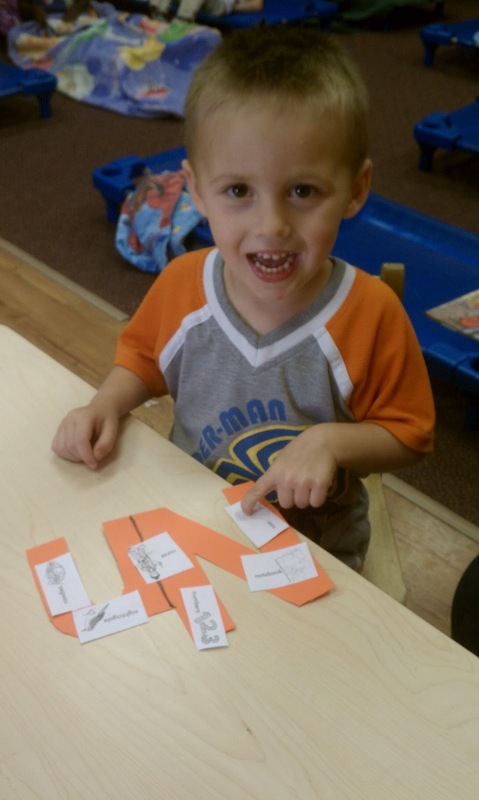 The 2's made "n is for net". 3...2...1...BLAST OFF!!! It's Space week here and we are all having so much fun as we pretend to be astronauts! We have even been doing astronaut exercises like lunar leaps and galactic gallops! We've also spent a lot of time talking about the planets and constellations. 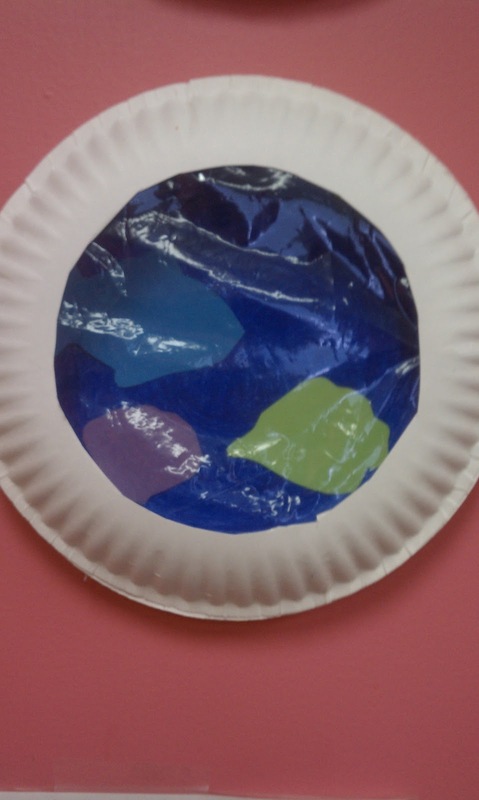 Some of the classrooms made their own planets from coffee filters. We also made a school wide solar system that we hung up in the hallway in the correct order. 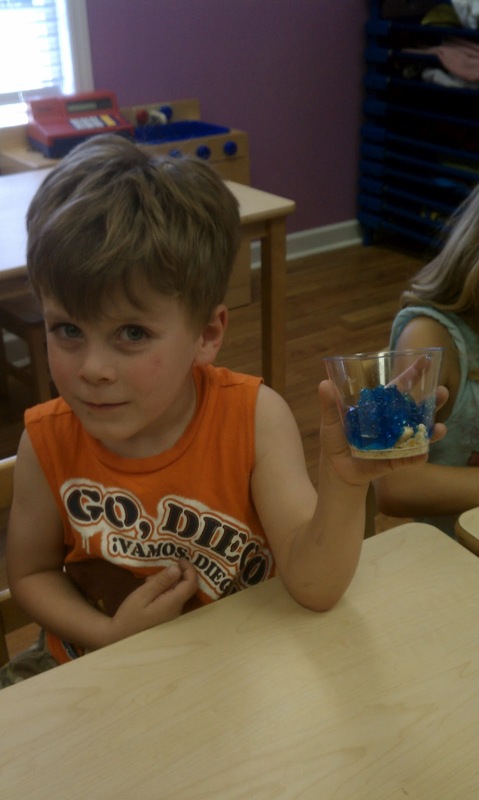 Each classroom made 1 or 2 planets so that we all contributed. The children are really proud of it- I'm not sure we will ever be able to take it down! 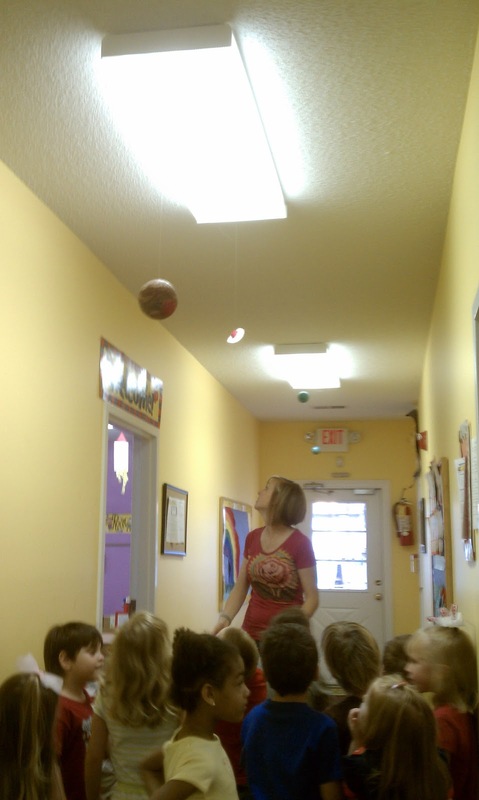 The Pre-K class took a walk down the hall to look at the Planets! They also practiced saying them in the right order! While talking about astronauts, we of course have to learn about rockets! The children made their very own rockets while practicing writing their name. Our cooking project was "Rocket Dogs" were we made hot dogs look like little rockets! 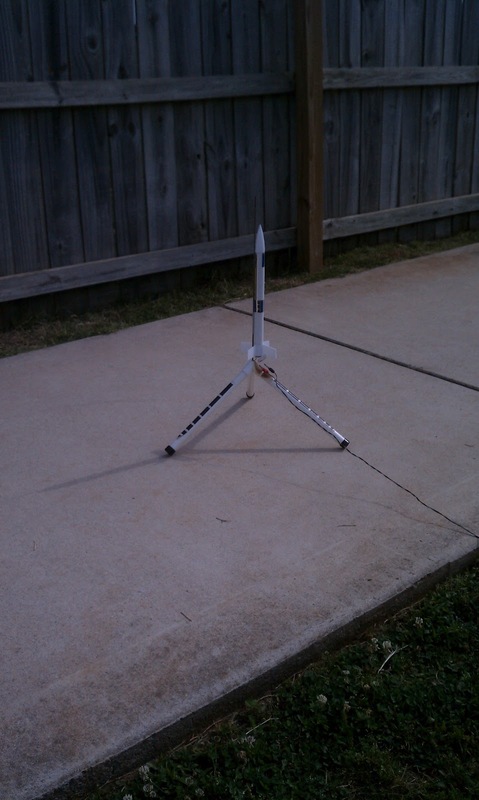 This is the rocket before they launched it!